Need to change the Fn / F keys from action keys (default) to the F1-F11 keys. Not able to locate a Fn Lock with the keyboard. Not able able to change via Bios - no setting available in this version. Any info, help, tips, advice greatly appreciated. If not possible please let me know whether a new keyboard with the option would suffice. Thank you for posting on the HP Support Community. I see that you need help in changing the functionalities of function keys on HP Pavilion Desktop 590-P0xxx. When was the last time it worked fine? Could you please share the keyboard picture? Change the action key setting from the BIOS Setup Utility. Press and hold the power button for at least five seconds to turn off the computer. 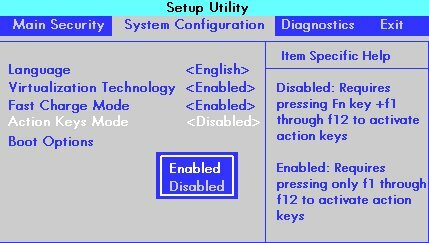 Turn on the computer and immediately press the f10 key repeatedly to open the BIOS Setup Utility. Press the right or left arrow key to select the System Configuration menu. Press the up or down arrow key to select Action Keys Mode. Press the Enter key to display the Enabled / Disabled menu. Press the up or down arrow key to select one of the options. Press the f10 key to save the selection and restart the computer. Also, you can refer to this Article How to Lock or Unlock the Fn Key. Hope this helps! Keep me posted for further assistance. If I have helped you resolve the issue, feel free to give me a virtual high-five by clicking the 'Thumbs Up' icon below, Followed by clicking on "Accept as solution" from the drop-down menu on the upper right corner,Thank you for posting in the HP Support Community. Have a great day! Unfortunantly my bios is different to the one that your steps refer to and has no option to switch off the action keys. Nor does the keyboard appear to have any options to lock / unlock - see below. Unfortunantely this makes the options on the site you linked not possible as well. Please advise of any alternatively ways. Thank you for posting back. Don't worry as I have a few suggestions which should help you. The keyboard your using is called chiclet or Island keyboard. Press fn and the left shift key at the same time to enable Action Key mode. When the Fn key is on, you must press the Fn key and a function key to activate the default action. Unfortunantly still not switching the f keys over to function keys - as opposed to Action keys. Have tried for both left and right but neither working. Is that the correct procedure? I appreciate your efforts to try and resolve the issue. Just try with Fn+left Shift key and check. Keep me posted for further assistance. Thanks for the reply Echo_Lake. Have tried the fn+Left shift. Does not change the fkeys. I really appreciate your efforts, let's try these steps once again to ensure bios settings are enabled. Press the power button to turn on the computer. Use the right-arrow or left-arrow keys to navigate to the System Configuration option. Use the up-arrow or down-arrow keys to navigate to the Action Keys Mode option, and then press the "enter" key to display the Enable / Disable menu. Select the desired mode: If If the issue persists after performing these steps, continue to the next step. Thanks again for the response. As noted above, my BIOS does not have this option. My BIOS was current. I've run the update again anyway but still there is no BIOS option for Action Key mode. Have tried another keyboard which has a designated fn-lock key and it works for that keyboard. I think the issue is that this keyboard simply does not have an Fn-lock (Action Key) option. Would this be correct? I appreciate your efforts to try and isolate the issue, as you've performed relevant troubleshooting steps and mentioned alternate keyboard works fine, hence this explains Functions key options are not available with this keyboard.